Elyamani, A., Caselles, J., Roca, P., Clapes, J. 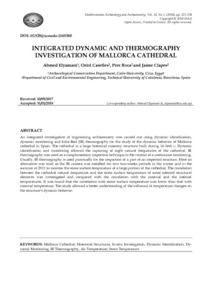 Integrated dynamic and thermography investigation of Mallorca cathedral. "Mediterranean archaeology & archaeometry", Gener 2018, vol. 18, núm. 1, p. 221-236.